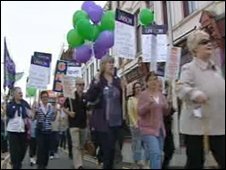 More than 100 campaigners fighting to save six care homes in Carmarthenshire have marched through Llanelli. The county council is looking to change the way it looks after the elderly, putting greater emphasis on helping people to live independently. A campaign has been set up to oppose any closures and protesters chanted "save our homes" as they marched. Carmarthenshire council said no decisions had been taken and a working group was looking at the proposals. Campaigners said the closure of the six residential care homes - St Paul's and Caemaen in Llanelli; Annedd in Llanybydder; Argel and Cartref Tawelan in Carmarthen; and Glanmarlais in Llandybie - would lead to the loss of 175 residential care beds and around 150 jobs. They say they want to ensure that everyone who requires dependant care has the right to a place in a residential care home where they can be properly looked after. Carmarthenshire council said it wanted to reassure older people that their health and wellbeing would be its priority. But The Reverend David Jones of Greenfield Chapel said: "Everybody is very concerned about the future of the care homes." He said he understood councils were under pressure to save money. But he added: "The individuals are in homes where they have been for many years and they are happy there - where are these people going to go?" June Newmhan said her 90-year-old sister was a resident at Caemaen. "She loves it there and chose to go there because she could not look after herself anymore," she said. "They [the residents] are awfully upset even if you talk about it - you can see them worrying about it, thinking where are they going to put us?" Bruce McLernon, director of social care, health and housing, said: "It is important to reiterate that no decisions have yet been taken. "A politically-balanced task and finish group is currently investigating the proposals to remodel care services for older people in the county, and will be presenting their findings to executive board this summer." He said the working group was looking "in depth, carefully and sensitively at all the available options to find the most effective ways of improving care provision for older people in Carmarthenshire". 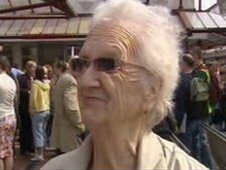 Councils across Wales are looking to provide "extra care" housing which they say offers older people more independence.